Out with the old and in with the new. Effective during the January term, Academic Technology will be updating Blackboard. Blackboard 8 will be replaced with the newly vamped Blackboard 9.1 with new features such as customized homepage settings, notifications and better organization. The functions of the newer version have become more streamlined, giving faculty the ability to submit assignments with one click instead of the two or three extra steps they needed before. Students can personalize and set their notifications that they receive on Blackboard and through email. 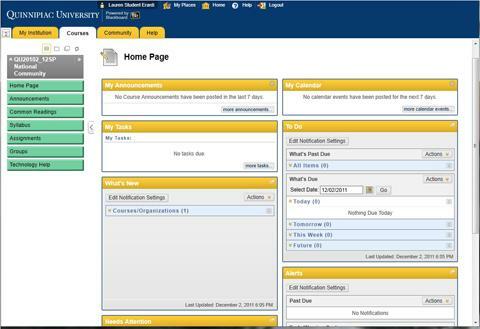 With the notification abilities, students can sign up to receive emails or dashboard notifications on Blackboard for such things as upcoming tests, assignments, if a grade was posted and if an assignment is overdue. The current Blackboard went down for a while and still does, but other than that there was nothing really wrong with it, Phillips said. A new tool, Galaxy, provides faculty with a centralized place to store content, said Erardi. Galaxy lets faculty upload one document for all the sections that they are teaching. If they have to update that document, they change the document once and it would dynamically update everywhere the document is posted throughout their courses. There are a lot of changes to the Blackboard in order to help the faculty with posting information for their courses. Blackboard 9.1 lets faculty embed YouTube videos, SlideShare presentations and Flickr photos right into Blackboard. Academic Technology will be installing Blackboard 9.1 the night of December 20 but it will not be available to use right away. Students shouldn’t have a problem accessing their grades because it is done through WebAdvisor, which is a different system, Erardi said. Academic Technology has held workshops to start teaching the faculty how to use Blackboard 9.1. So far, 150 faculty members have attended these sessions. Student training sessions will start this week and some will be held in the spring semester.